Waters was speaking in an interview on the Roland Martin show when he asked her, “What happens in 2016? That video only has 13,000 views. This was not done in secret. This video and interview was seen little and talked about less when it came out in 2013. We are also reporting today that Freedom Watch has uncovered some disgusting information as well. Our own Nancy Hayes reports that a massive amount of data on 47 hard drives from a government whistle blower was turned over to the Freedom Watch group recently. Americans should be OUTRAGED! It looks pretty solid that Illegal and unconstitutional electronic surveillance was committed by the Obama administration. Not only did the illegal electronic surveillance involve Obama, it involved several top level officials within the NSA, CIA, DHS, FBI and Treasury Department. Heads should roll! President Trump was right when he said he was “wiretapped” by Obama and “The Hammer” is about to go down. The information proves Obama and company spied on everyone. He has spied on Trump! He has most likely spied on many of you! I remember how J. Edgar Hoover had something on everyone. This enabled him to not be fired as FBI Director. When he died (code name Open Territory) everyone scrambled to find the hidden files. Or maybe that was just a Robert Ludlum book…? A ‘shocking’ discovery was made when a pair of researchers at Harvard Business School decided to analyze the impact of higher minimum wages in San Francisco on restaurant failures…hint: they went up. Entitled “Survival of the Fittest: The Impact of the Minimum Wage on Firm Exit“, this latest study on the devastating consequences of minimum wage was conducted by Dara Lee Luca and Michael Luca and concluded that each $1 increase in the minimum wage results in a roughly 4-10% increase in the likelihood of a restaurant going out of business. In this paper, we investigate the impact of the minimum wage on restaurant closures using data from the San Francisco Bay Area. We find suggestive evidence that an increase in the minimum wage leads to an overall increase in the rate of exit. …And while we enjoy the affirmation of a conclusion that we’ve presented multiple times from such a reputable organization as Harvard, one which pretty much anyone could deduce with the application of just a moderate amount of common sense, for some reason the following scene from “Good Will Hunting’ comes to mind. The “Lawful Purpose and Self Defense Act” Has Been Proposed! On Wednesday, May 24, 2017, Chairman of the House Committee on Natural Resources Rob Bishop (R-UT) introduced H.R. 2620, the “Lawful Purpose and Self Defense Act.”This bill would remove ATF’s authority to use the “sporting purposes” clauses in federal law in ways that could undermine the core purpose of the Second Amendment. Under Chairman Bishop’s legislation, all lawful purposes – including self-defense – would have to be given due consideration and respect in the administration of federal firearms law. While the NRA’s announcement above is poorly written, the message is clear. WE (gun civil rights advocates) are becoming the vanguard. Sporting purpose never had a place in the Second Amendment. Period. Nice we are on the right side, for once. Perhaps not, but here’s some possible alternatives! It is easy for those of us who live in states without “assault weapon” ban (or worse) restrictions to thumb our nose at shooters in California, New York and New Jersey. Some of the compliant builds I have seen would make any respectable shooter want to cry. But how does the saying go: “walk a mile in a man’s shoes”? Having lived in enemy territory for a decade, I can sympathize with our range-loving brothers and sisters being held captive by ridiculous regulations. Sure, I can see the comments section filling up now: “shall not be infringed”, “will not comply” or better yet “F*** California”. It may seem simple to just brush off whole sections of the country as lost when you don’t know anyone who lives there. But, if you have family or shooting buddies in California or New York, you may actually start to sympathize with their plight and understand why they buy, build and use the guns and gear they do. As a writer here at TFB, I probably haven’t done a great job at highlighting the important work being done by manufacturers catering to restricted-style products. 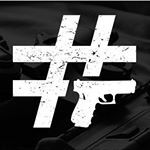 So in an attempt to turn things around, I asked for help from the social media powerhouse #hashtagtical who works alongside organizations like The Calguns Foundation to promote responsible gun ownership in California. Of course, we steer clear from politics here, but any organization that promotes the safe and legal use of firearms obviously gets my support. Now, “top 5” lists can be annoying and seem like click bait – you know, like the rags in the grocery line with headlines that read ‘41 ways to please your… Boss’. And we’ve reported on a few of these products before. However, I’d like to start with this story, take input from our readers, and move forward with additional products in the future. Have a suggestion? Leave a comment, send me an email or follow us on social media. 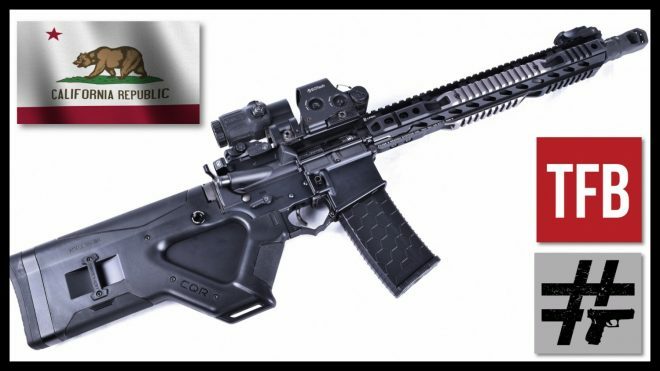 AR MAGLOCK allows California AR-15 owners to comply with existing fixed magazine laws, thus avoiding Department of Justice registration. 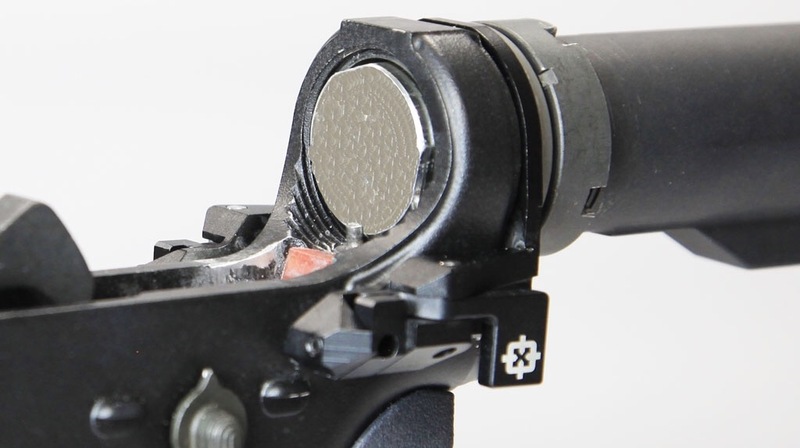 The AR MAGLOCK engages the magazine so it stays “fixed” in the firearm until the action is disassembled, complying with California SB 880 & AB 1135, and Department of Justice regulations. It is our reasonable belief the AR MAGLOCK complies with New York NY SAFE , Connecticut, Maryland, New Jersey and other states (and other local municipalities such as Cook County Illinois) detachable magazine laws based on our in depth analysis of these laws and regulations. The Strike Industries Simple Featureless grip matches the contour of our popular Enhanced Pistol Grip, but allows for usage in feature restricted jurisdictions. The SFG requires no permanent modification to the receiver of your host system, and is constructed of durable reinforced polymer. As suggested by the name, the SFG a simple and affordable component for your featureless AR build. By removing your rear takedown pin and installing Cross Armory’s QUICK PINS you will enjoy improved convenience when breaking down your weapon. QUICK PINS allow for easy opening and servicing of your weapon with a simple pinch of your fingers. Closing and locking your receivers together is as easy a closing the two receivers together, QUICK PINS will automatically lock your receivers into place. QUICK PINS allow for the easiest access to your firing mechanism. 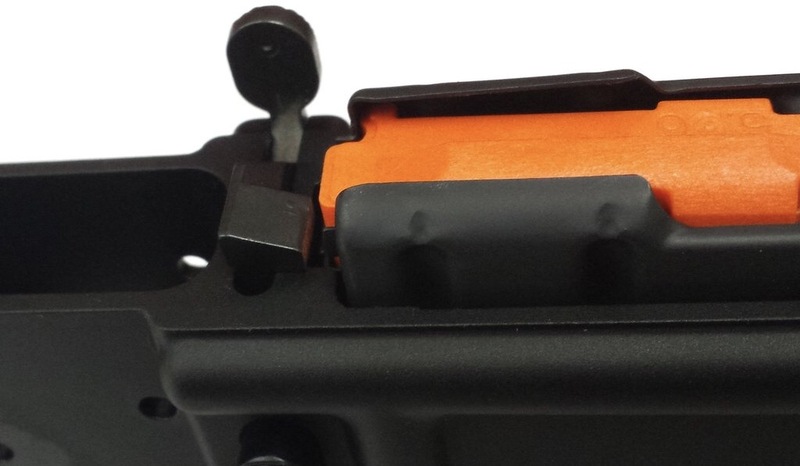 FROM MILES V.’s SHOT 2017 COVERAGE: LWRC’s answer to the new California compliance laws is a sort of spring operated plunger that deactivates the magazine release once the upper receiver is assembled onto the lower receiver. Field stripping the rifle and ‘popping the top’ allows the plunger to be released, and the magazine to be released naturally by pressing the magazine button. To facilitate the field strip, LWRC has extended the rear take down pin to include a sort of port that makes gripping it easier, but also allows for a piece of 550 cord or likewise material to be threaded through the port and creating a loop to pop the rear take down pin out. Unlike other companies that have a specific Cali-Legal rifle variant, LWRC has this as an option, wherein most of the companies models can be retrofitted with the plunging device and rear take down pin. Currently it is patent-pending, but it has been approved by the California DOJ. Available as an Accessory or Installed in Brand New Franklin ArmoryTM Firearms. YRMV, depending on how restrictive your State actually is. Check with a lawyer before making such a purchase if you have any question as to it’s legality. How these work-arounds meet with your individual State laws (N.Y., N.J.?) is up to you to research. I am SO GLAD I live in the (relatively) Free State of Arizona! Of course, I cannot afford anything, regardless. I’ve always owned a car. At least, since I was a licensed driver. First, a loaner from my parents, then a used car (bought with assistance from my parents). Then, a succession of beaters (to which Dave-the-mechanic can attest!). Finally, after the accident, I bought my dream car – a 1989 Isuzu Trooper! This was in 1995. Most of my previous cars were at least 10 years old when purchased. I just never had the money/credit to buy new. When the Izuzu ‘gave up the ghost’ seven years later, I already had begun looking for a replacement. The engine blew, and I needed a car. I was still working, commuting, and one really needs a car to get around the Valley. Credit, money, income limited my choices. I ended up with a 2000 Oldsmobile Intrigue. (This was 2002!) She was NOT my first choice, but I did qualify for her. Who knew she would last fifteen years? The sad part is, now she is worth maybe $500, if I’m lucky. She still runs (the engine is still powerful), but needs major work – rack and pinion leak, crankcase leak, a/c compressor, engine mounts and window regulators, and many other things. I’ve been advised not to drive her unless it’s absolutely necessary. And, as I now drive J’s car (a 2006 Honda Element, the a/c works!) it seems silly to insure two cars. We rarely need both. SO…I’m either selling or donating the car. It will be the first time since 1970 (broken beater car downtime excluded) that I’ve not actually HAD a car. I’m looking at one Internet site who claims to buy cars. As well as Father Joe’s Villages charities and the Salvation Army. And it makes me sad and a little scared. I can no longer walk very far w/o pain. And, what if J’s car goes South – then what? To get the Olds road-worthy is a minimum $1000. Seems silly on a $500 car, when a second car is available. So she’s on the block. Immigration impacts virtually every challenge and threat America and Americans confront each day. Failures of the immigration system have cost thousands of Americans and others present in the United States their lives. The 9/11 Commission, to which I provided testimony, identified those failure of the interior enforcement program, as being at heart of the ability of terrorists, and not only the 19 hijackers who carried out the terror attacks of 9/11 but other terrorists, as well, to enter the United States and embed themselves as they went about their deadly preparations. Members of pernicious transnational gangs from around the world, and not just Latin America, have easily entered the United States and set up shop in towns and cities across the United States peddling narcotics and perpetrating violent crimes. Failures of the immigration system have not only surpassed the wages of American and lawful immigrants but have also cost millions of American workers their very jobs. I’m all about legal immigration. This Republic was built on and by immigrants. Certainly there were illegals one hundred years ago, not passing through Ellis Island (or the equivalent). But times, technology, and populations have changed. As have the immigrants, themselves. There was a time folks strove to come to America to live the American Dream. Many still do. But, there are those who hold to their non-American cultural, criminal or religious traditions. We need to keep them out. How we do that, and at what cost is the question. The Manchester bomber was a British citizen, born in Manchester of Libyan immigrants. ‘They’ are playing the long game, people!